Misty morning, tall trees, untouched hills and a breath of fresh air - this exactly what Kasol is! Take a trek in winter to experience the best of Kasol. Explore the best of Kasol by trekking with an experienced guide. Trek to Chalal and Grahan which offers the best panoramic views. Day 1: Report at Kasol camp and explore local areas. The guests are required to report at the riverside basecamp in Kasol lastest by 11 am. Fresh breakfast will be served at the basecamp and post breakfast, take a walk to Chalal, also known as the little Amsterdam. While on the walk, explore the local market and Israeli cafes in Kasol. Explore the area at a leisurely pace. The complete walk may take up to 2 hours with the breaks. One can sit at the end of the village admiring the beauty of fiercely flowing Parvati river. Reach the campsite by evening and enjoy the warmth of a bonfire and some fresh dinner. Wake up to the beautiful Himalayan sunrise at the base camp and after breakfast, drive to the centre of Kasol to the starting point of the Grahan trek. It's an easy trail which is frequently used by locals and goes through the pine forests. After reaching the Grahan Nahal, the trail becomes rocky and steep for an hour. The last bit of the climb will take us to Grahan Village, the destination for the trek and beautiful views of towering mountains. Dinner will be served at the camping site and overnight accommodation will be arranged in the camps. Wake up to a beautiful sunrise and enjoy the breakfast before starting the trek towards the north of the camping ground at Grahan. The trail to Min Thatch is also used frequently by the local shepherds and villagers. Soon into the trek the views of Min Thatch, Nagaru and Sar Pass top can be seen. The trail goes through the lush green forest before reaching Min Thatch. The views of Chanderkhani and other snow-covered peaks are clearer from Min Thatch. Overnight accommodation will be arranged back at Grahan. Start the hike down to Kasol after the breakfast. The trip ends once at Kasol. Accommodation in Kasol at twin/triple sharing. The couples will be provided accommodation at twin sharing basis. All meals - Starting from dinner on day-1 till breakfast on day-4. Trekking permits and forest camping charges. Service of a knowledgeable guide. Tents, sleeping bags and tent mats. Any kind of personal expenses. Porter to carry personal luggage (can be arranged on request at the campsite at additional cost). Unforeseen handling costs due to weather disturbance, landslides, political unrest. However, all best possible assistance would be provided in case of exigencies. The trip involves trekking and hiking so we recommend the guests to carry closed walking shoes with good grip. For the winter getaway in Kasol and Grahan, we recommend the guests be prepared for cold with temperature ranging from below 0 Degree at night to up to 15 Degree during the day. Please avoid carrying expensive watches, jewellery and electronic items on the trek. Anyone above the age of 15 Years may join this Trek. There is no upper age limit for joining this trek. You should be physically fit to join the trek. Report at the basecamp in Kasol base. 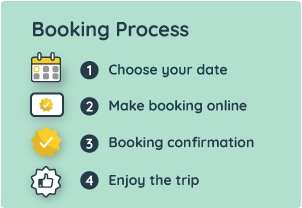 The complete address to the reporting point, local contact person details and phone number are shared in the booking voucher send via email after booking.